Please select your item(s) and add them to your basket. Then click on the basket icon in the main menu which will take you through the steps to the payment page. Our bangles come in the following standard sizes but can also be made to order to your specific measurements. Our bangles are measured using the internal diameter – distance across the middle of the circle taking the internal measurement in mm. Take care when measuring to get an accurate result – you may need help to do this! If you do not know your ring size, you can go to a jeweller and ask them to measure your finger. 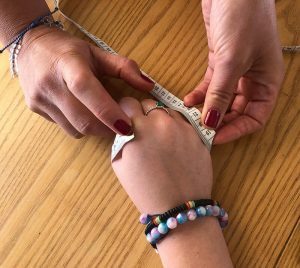 The other option is to request a ring sizer which I will post out to you at a cost of £2.00 - click here to order. Treasure and care for your hand-made silver jewellery in the right way and it will retain its beauty for many years to come. Following the advice below will help you keep your pieces looking as beautiful as they did on the day you bought them – and that will make us very happy too! Create a list of beautiful jewellery you would love to buy or receive as a gift. Just create your own account, build your wish list and then share it – dropping hints has never been so easy! Payment must be made in full for your order including postage costs before the order will be packaged and dispatched to you via Royal Mail 1st Class Special Delivery. This guarantees next day delivery by 1pm and covers the item for loss or damage, it can be tracked by Track and Trace Service (Royal Mail) and does need a signature on delivery. Small parcels under 100g and with a value under £50 - postage will cost £4.40 per package. Orders over £200 will be delivered free of postage costs. VAT of 20% is already added to the prices shown for materials used. If you need your item for a particular deadline it is essential to order well in advance especially if overseas or during a seasonal rush. Always double check the processing/dispatch times for each item as these may vary, especially if 'made to order'. If items are in stock, they will usually be dispatched within 5 working days within the UK. Any items stated "handmade to order" will be dispatched within 2 to 3 weeks within the UK. You will receive an email once your purchase has been dispatched to you. Payment is accepted via PayPal shopping cart which also accepts credit and debit cards. Orders can be cancelled anytime up until the item has been dispatched to you. return the parcel using Royal Mail 1st Class Special delivery and send me a photo of the receipt so I can add this cost to your refund. If another delivery method is used, this is at your own risk. If the package then goes missing or is damaged in transit, a refund will not be issued. JmB Silver is committed to protecting your privacy and will only use information we collect about you lawfully (in accordance with the Data protection Act 1998). We use Mailchimp to collect and store any personal data that we keep about you which is a secure way of storing and managing data. JmB Silver will never collect sensitive information about you without your consent and any information that is held will be accurate and up to date. Please email me if you would like to check any information that is held about you and if there are inaccuracies, these will be corrected or deleted immediately. Personal information held about you will be held securely in accordance with the UK law. If information is to be transferred outside the EEA (European Economic Area), your permission will be sought first. Technology may be used track the patterns of behaviour of visitors to the JmB Website. This can include a "cookie" which would be stored in your browser. You can usually modify your browser to prevent this from happening. Information collected in this way can be used to identify you unless you modify your browser settings.